The Nuvo NSF1 student flute weighs just 255g and is approximately 60 percent of the weight of a metal flute. 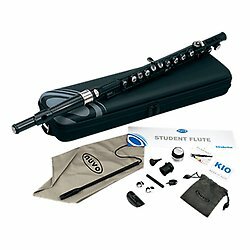 The Student Flute is a fully fledged instrument with C-foot and straight head joint and the main body plays down to D.
It is washable, durable and comfortable to play plus interchangeable parts mean the instrument can be used at different levels from the beginner, to the more advanced player. Full range of parts always available.